I based this active Spanish color game on an activity kids do in P.E class. It works well for the early grades and you can use it with letters, numbers or other vocabulary. I teach a lot of younger students, so I use active Spanish games in every class. 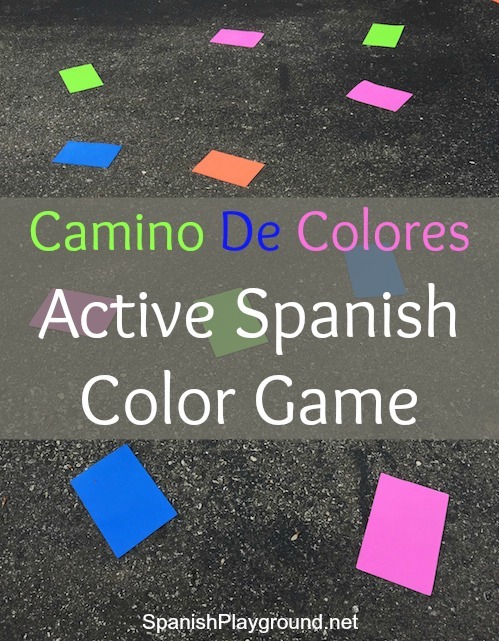 Camino de colores is a Spanish color game that gets kids up and running. It is not a competition, but it is lots of fun! You can find a similar physical education game on many websites. For example, there is a description on PhysedGames. This is a no-prep game, and all you need to play are color spots of some type. I use foamy flowers or squares, but anything will work as long as it is big enough to see from a distance (construction paper, paper plates, hand towels, etc.) You need several of each color. First, spread the color spots randomly across the space. Put out several of each color. Students can help with this. Then, divide the class into 4 groups, and have each group stand on one side of the playing area. With small classes, I don’t make groups. Instead, we all start together on one side and all run at the same time. You can adjust how many kids run at a time to the space you have. Next, call out a sequence, the camino de colores. For example, rojo – verde – azul – amarillo. With preschoolers, I use three colors. You can start with two colors if you have very young students. Kids have to remember the sequence. They run from color to color in that order. Tell students to say the color aloud as they reach it. When the students have completed the sequence, they run back to their group. Call out a new pattern, and another player from each group runs (or the whole class runs again). Finally, have students call out patterns too! Even my youngest students can do this. As they do, they speak Spanish without thinking about it. If students know the colors well, you can change the movement to brincar, caminar, bailar, etc. You can also substitute numbers, letters or vocabulary pictures for the colors, as long as they are big enough to see. Camino de colores is good listening practice. This Spanish color game is basically self-correcting. Students say the color as they reach each one. If a player isn’t sure of the vocabulary, she can check by watching others. The activity is low pressure. If a student runs to the wrong color, there is no penalty. It is an easy way to get kids producing Spanish. Genius! I picked up a pack of colorful foam footprints that I still wondered how I would use. This will be a perfect game! Thank you!